Today there in no longer any doubt that Putin has decided to launch a large-scale war with Ukraine after all. The present situation in the ATO zone is very complicated. It will become evident in the next few days if the Ukrainian command has a plan B for the intensified Russian presence. Espreso TV wrote on January 18 that Putin has decided on further escalation in the Donbas and has begun informational preparations for the active involvement of Russian “lost paratroopers” in the war. At that time a ghostly chance still remained that it would not come to this. Today, however, we can already see the first results of Putin’s decision — Russian and terrorist forces have increased considerably. Fighting is continuing along the entire ceasefire line, and the direction of the advances that are the current priority for Putin’s troops is becoming clear. First, it is the Donetsk airport, which, despite having no strategic value, has become a symbol of Ukrainian resistance. This is why the seizure of the airport is essential for Russian PR, for lifting the morale of their own soldiers and humiliating Ukrainians. Today, as in previous days, fierce fighting is taking place at the airport. The capture of eight Ukrainian soldiers today — news that was gleefully rebroadcast by Russian propagandist media — while unpleasant, to put it mildly, has no decisive meaning for the outcome of the battle for the airport. Right now the fighting is continuing at the airport, where hardly anything remains. Whatever remains of the airport buildings will ultimately be destroyed by the constant shelling ; there will be no reason nor even any possibility for anyone to hold on to it. The second direction, where the situation is somewhat more alarming than at the airport, is the so-called Bakhmutka highway. Today Ukrainians have withdrawn from the 31st checkpoint and are withstanding fierce shelling and attacks by Russian troops. As the National Security and Defense Council (NSDC) has indicated, Ukrainian troops have stopped the enemy’s advance, but the situation remains very tense. 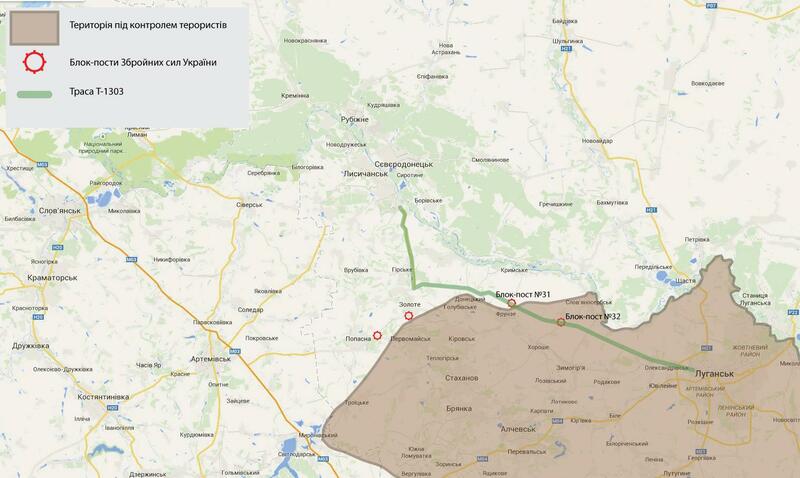 The danger is that by taking Bakhmutka highway Russians would open a direct path to the Lysychansk-Severodonetsk-Rubishne conglomeration and open up the possibility of surrounding the strategically important city of Shchastia, where the thermal power plant that feeds electricity to Luhansk is located. Additionally, there is a direct path from Shchastia to the north of the oblast and then on to Kharkiv. This entire activation of the militants has a simple explanation. According to the same NSDC, over the last two days two tactical battalion groups have crossed the border. Naturally, these are regular Russian troops, without insignia, who are now playing the role of “people’s militias.” According to NSDC, these are the forces that are taking the key role in the advance on Bakhmutka. Moreover, new units of the regular Russian army are approaching the Ukrainian border. There is no doubt that very soon they will cross the border as well and will further strengthen the terrorist forces. In addition, against the background of the offensive at the front, the terrorist war is spreading to our rear. Last night there was another explosion in Kharkiv, and today the railway bridge in the Zaporizhia Oblast was blown up. If the terrorist act in Kharkiv was designed primarily to terrify and to distract forces from events at the front, then in Zaporizhia it was an attempt to destroy one of the important supply lines for Ukrainian troops. All these facts show that Putin has decided to repeat his August course, when the “Ilovaisk cauldron” was created with the help of the regular Russian army that had crossed the Ukrainian border and a significant part of the Donbas was occupied. Obviously, the Russian dictator is counting on repeating last year’s success and on adding new territories to the terrorist Novorossiya. As became obvious in August, the Ukrainian command, unfortunately, did not have a plan B for a possible Russian invasion, and this resulted in the catastrophe near Ilovaisk. Does the General Staff have such a plan now? The answer to this question will become apparent in the coming days.